What’s not to like about a sweet treat? This year, weddings of all sizes and styles are embracing all sorts of fabulous sweet treat trends. 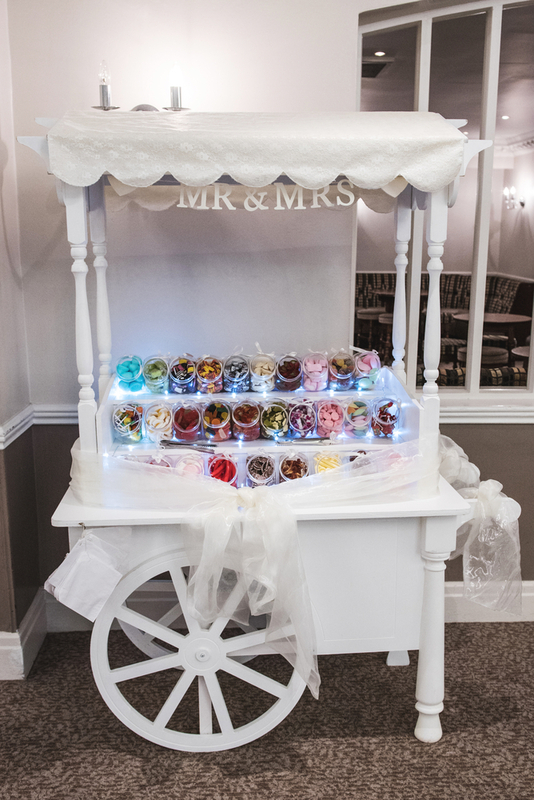 Why not indulge your guests with the ultimate sweet treats on your wedding day. The doughnut wall has to be one of our favourite inventions of the past few years. Why has nobody thought of creating these amazing treat stations before? They work wonderfully as an alternative to a traditional plated dessert at your reception. 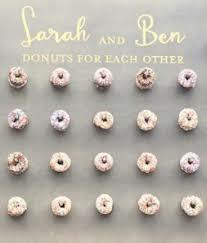 Why not colour code your doughnuts to tie in with your wedding theme, or choose flavours that are favourites for you and your other half. As well as the eye-catching visual display that will have everyone talking, we’re totally taken by the ‘hands on’ experience it gives as people choose their own doughnut. What’s not to love? 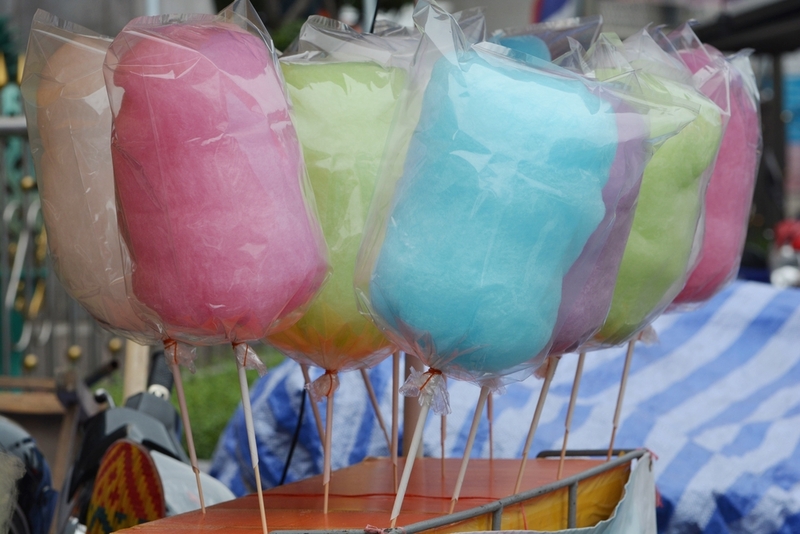 Roll up roll up to the fair and the promise of some good old fashioned candy floss! Who needs chocolate fountains when you can go for a candy floss machine instead. It’s fun, it’s frivolous and will appeal to all ages.  Search online to find companies who can provide machine hire or even provide you with a candy cook to serve your guests individually. Would you believe you can even colour code your candy floss in keeping with your wedding colours? You can serve candy floss at your reception, or what about creating bags for everyone to take home with them at the end of the celebrations as alternative favours? Just invest in a stash of clear plastic food bags, some ribbon and tags and you can create your own tasty treats. Another colourful option is meringues. Cute, sweet and available in every colour of the rainbow, these fluffy, gooey morsels look amazing when stacked in lots of different colour shades. Not just pretty, meringues are a good gluten free option and make a great customisable dessert option. Bowls full of whipped cream, chopped nuts, fresh fruit and a choice of sweet sauces create the perfect buffet style dessert where guests can help themselves and create a personal Eton Mess. The common cupcake has been pushed aside by the more sophisticated, elegant sweet treat… the macaron. 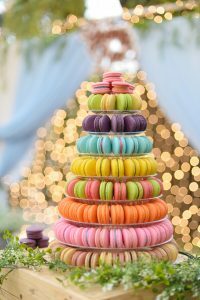 We love the current trend for macaron wedding cakes when hundreds of individual macarons are layered in tiers of eye-catching colours to create the illusion of a more traditional wedding cake. You can colour and flavour each layer differently so it’s a fabulous way of creating an alternative wedding cake with a real wow factor. Create your macaron tower as tall or small as you desire to make a stylish and delicious centrepiece for your big day. For a relaxed option, why not give your guests the freedom to help themselves whenever they fancy a sugar fix by laying on a traditional sweet cart? Choose your favourite retro sweets and your guests can simply graze whenever they like. For an authentic olde sweet shoppe experience, buy striped paper bags online (you can even personalise these with your names and wedding date) and then guests can help themselves to a stash of sweets before they head home. We guarantee that everyone from the oldest to the youngest of your guests will be delighted by your super sweet treats. To learn more about the latest trends for memorable weddings, give our knowledgeable wedding planners a call today. Why not arrange a private tour of our stunning country Manor house while you’re at it? Give us a call on 01394 411288 or email info@woodhallmanor.com to find out more about Woodhall Manor. Take a look at our Inspiration Page for more fabulous ideas for your wedding!